"Jake of Hearts" was the ninth episode of the third season of Daria (episode number 309). It first aired on MTV on July 21st, 1999 and was written by Dan Vebber. At the start of the episode, Daria and Jane are discussing how puppets make any atrocity funny when they're interrupted by the arrival of two newscasts for Z-93's "Mental in the Morning" radio show. Principal Li has invited them to provide morale for the school - Daria questions if removing hidden cameras and bomb-sniffing dogs wouldn't do this too - and silence naysayers. Daria asks if Z-93 is paying them for the stunt; " Ms. Morgendorffer, those bomb-sniffing dogs have to eat!" Later at the Morgendorffer’s that evening, during dinner, Jake is so excited about a new dish and miffed due to his wife and children’s disinterest that he goes on a stronger rant than usual and has a heart attack. Later at the hospital, Helen and the girls are told that it was just a scare and that he should be spared from stress. Later, as his family stands by his bedside, Jake asks for his mother. While witnessing this, Daria has to listen to her father’s anxious speeches and beliefs that he will not live much longer, while at the same time having to endure the constant Z-93 stunts at school and the DJs pressuring her to be part of the show. 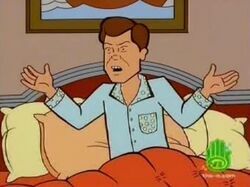 In a low point, "Mental in the Morning" offers a Z-93 bumper sticker as a prize to anyone who'll date Upchuck as a prize; Jodie Landon thinks this is too humiliating, to which Daria remarks "Think how the bumper sticker must feel." This leads to the DJ's trying to get her to do it ("You look like you could use a date"). At a later conversation between Ruth and Jake, details of their previous life with "Mad Dog" Morgendorffer begin to surface, revealing that his father had been an abuser of both her wife and son, and she wishes she'd done many things differently. "A few days ago, my father had a heart attack, forcing me to admit his mortality to myself for the first time. Accepting this grim new knowledge has been especially difficult, as I've been under constant, yammering assault by two utterly brainless and talentless so-called radio personalities. And so, for these reasons, I, Daria Morgendorffer, am mental in the morning." The DJ's abruptly flee the school. At home, she calmly puts her grandmother on the spot when she notices how bad her decisions regarding her husband had been. This effectively silences Ruth ("You both owe me") by making her realising she's doing more harm than good. Finally, Daria tries to help her father. In the face of his concerns about whether he's doing a good job as a father, Daria dodges the issue and cures him of his despondency by noting her granddad was dead at this point. Feeling like he's beaten his father - "I'm better at living!" - revives Jake from his funk, and the instant he's okay Helen goes back to overworking and Quinn abandons studying. 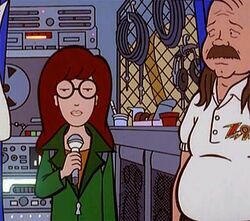 At the end of the episode, Daria tells the previous days’ events with Jane while at Pizza King and how she reluctantly sees home and school could both be worse. That's when Z-93 parks and starts broadcasting right outside. Jake rants "[Dad] tried to mold me into a soldier, but did he ever let me have a G.I. Joe? Didn't want his boy playing with dolls, he said! ", and that it wasn't a doll but "an action figure!". The original G.I. Joe came out in 1964, with the term "action figure" invented for it. If this happened before Jake went to military school (and it sounds like it did), then he has to go to Buxton Ridge Military Academy between 1964-8 and start at Middleton College in 1968, as "That Was Then, This Is Dumb" has him and Helen being arrested in August 1969. Unfortunately, "The Daria Diaries" has him lasting 'more than four years at Buxton and implying he was there at an earlier age than 14 (as does this episode, as he needs to learn how to shave at Buxton). Alternatively, he wanted a G.I. Joe toy when he was at military school but then you have to wonder why. This episode was one of those that turned aside from disaster at the last moment, much as happened in "The Teachings of Don Jake" and "Boxing Daria". Jake's heart attack has reappeared in many fanfics. In alternate-universe stories, it is often fatal. In post-canon tales, a subsequent heart attack is nearly always fatal. Ruth Morgendorffer refers to looking after "his children", indicating Jake has unmentioned siblings. Glenn Eichler would later mention Jake has an older sister. Jake had to learn to shave from Corporal Ellenbogen ("The man with one thumb?!") because his dad, allegedly due to razor phobia, refused to. Quinn's Jake-like quip of "Darn gallbladder" shows that she has some of her father's personality traits. Mr. O'Neill's is quoting Hamlet in his class. A large number of backgrounders based on MTV staff show up for the DJs. This page was last edited on 25 April 2018, at 17:45.